Have you ever thought about discovering a planet? It may not be as fanciful as you think. Astronomers at the Australian National University (ANU) want help in searching for a ninth planet thought to be orbiting our Solar System. With a working title of Planet Nine, it is speculated to exist beyond Pluto. Amateur stargazers have been promised input on naming the planet if they spot it on a website showing digital images of space. The website displays hundreds of thousands of images taken by a robotic telescope at the university's Siding Spring Observatory in New South Wales. The website shows images of the southern sky. 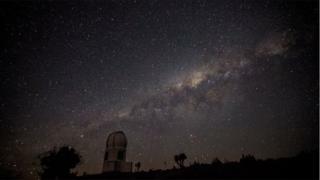 A similar search of the northern sky was organised by US space agency Nasa last month. ANU astronomer Dr Brad Tucker said he hopes Planet Nine will be found in the less-explored southern sky. "If this planet exists, it's already in one of our thousands and thousands of images," he told the BBC. Media captionWhy do astronomers think there may be a ninth planet? Although it opens up the possibility of naming input, rules set by the International Astronomical Union mean discoverers do not have complete control. "My personal vote is not for another Greek god, we have enough of those," Dr Tucker said. "I do not want Planet McPlanetface. As much as I like Boaty McBoatface, we won't allow that as an option." The project will be launched by Prof Brian Cox as part of BBC Two's Stargazing Live which begins on 28 March.